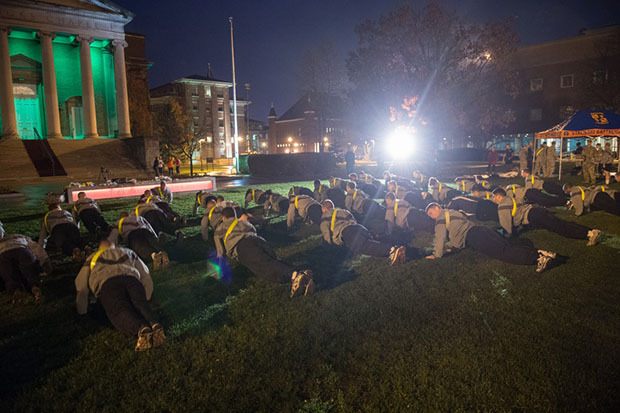 ROTC members warm up for the Veterans Day Run in front of Hendricks Chapel, which is lit up in green to “Greenlight a Vet,” an initiative of Walmart. Today, as the country celebrates Veterans Day, a federal holiday dedicated to honoring the men and women who have worn the uniform of our nation, Syracuse University is standing tall in its recognition and enduring commitment to veterans on and off campus. The day started with a Veterans Day Fun Run and Walk that began at 6:30 a.m. on the Quad in front of Hendricks Chapel. Below is a sampling of events planned on Veterans Day and throughout the coming week. The University community will gather to honor mothers, fathers, brothers, sisters, husbands and wives: ordinary people who have made themselves extraordinary through their heroism and selfless service to the country. Brigadier Gen. Michael A. Fantini, United States Air Force, will serve as the keynote speaker at the ceremony. During WWII, Technical Sgt. Forrest L. Vosler (U.S. Army Air Force radio operator) sustained serious injuries to his eyes, legs and arms when the plane he was in was shot down and crashed in the North Sea. For his heroic actions, he received the Medal of Honor from President Franklin Delano Roosevelt. Vosler was unable to complete his baccalaureate degree due to his combat injuries. He had, however, completed all of the requirements for the Associate of Arts Degree in Liberal Arts. This Friday, Syracuse University will posthumously award Vosler an associate’s degree of arts, thus making him a Syracuse University alumnus, Class of 2015. Members of the Vosler family will be present to accept the degree. During the first time-out of the game, Syracuse University will posthumously recognize Technical Sgt. Forrest L. Vosler (U.S. Army Air Force radio operator and Medal of Honor recipient) and members of the Vosler family.